This is kind of random, but how many of you have cooked Quinoa (pronounced Keen-wah)? I made some last night along some sweet and sour chicken and now our family is a big fan. It is light and fluffy, a little nutty, easy to cook (just cook in the rice cooker) and super healthy. I picked some up at my local Costco, but you can find it in bulk bins at the health food store or even on the grocery shelf. Have you tried it? yes i love quinoa, i also recently discovered this grain, i am surprised i had never had it before! Quinoa is great! My favourite dish is an apple curry quinoa salad. Nice and fresh for the summer. I also purchase quinoa in bulk. I use it wherever and however I use rice...great stuff! Quinoa's my favorite grain--light, fluffy, and a perfect protein, as well. I make it up in the rice cooker a couple times a week, then eat off the batch for the next few days. I like it with steamed greens, flaxseed oil, bragg's liquid aminos, maldon sea salt, and a little plain yogurt. It's my go-to "I'm so healthy" meal. if you speak french you can see my recipe with quinoa on my blog, see U soon !!! We have a bakers at our local shops who uses this grain in their products. Very healthy and tasty. Its totally one of my faves. You can savor it up by making it with veggie or chicken broth. Or you can make it sweet - put nuts and berries it in and keep it in the fridge - sprinkle with a little cinnamon in the morning and you have breakfast of champions! I've never tried it... but it looks delicious! thanks for the idea! I tried it once, and made it like rice with chicken, but wasn't too impressed. I think I needed more seasonings. I found a recipe where it can be cooked like oatmeal for a sweet breakfast cereal. I'm going to try that next. Mmmm...so delicious! I also love red quinoa - it makes the dish look so pretty! Try cooking it in vegetable or chicken stock. It only enhances the flav. i make quinoa lasagna and it is super easy, cooks in half the time of a regular pasta lasagna, and it's better for you. you just layer the kind of sauce you like with mozzarella and parmesan with the quinoa. cook for half an hour in the oven. super easy and really good. oh i just adore quinoa! if you haven't tried yet, head straight to whole foods and try their quinoa cakes! they are to die for! i really like it -- and honestly, i've been pronouncing it wrong all this time! I'm a lover of quinoa too! You can do lots of great stuff with it. I like quinoa better than couscous (even though I know one is agrain and one a pasta) for small, round, side dishes. It flavours better and I like the little pops of the grains in my mouth. Love it. We use it in Ina Garten's tabbouleh recipe with lots of cucumber, cherry tomatoes and feta. Delicious! I LOVE it! And It's SO healthy!!! I eat this a lot... usually with sauteed vegies, salmon and tahini sauce. I discovered it only 6 months ago! You can get Quinoa pasta as well, when I was trying to stay away from wheat and oats for food allergy reasons, I bought quinoa elbow macaroni and twisty pasta salad noodles. They cook faster then regular pasta so you have to be careful or you'llhave mush, but excellent substitute for food allergies but allows you to still enjoy pasta. I like the quinoa pasta better then rice pasta. I had it in soup while in Peru and loved it! Unfortunately I haven't been able to find it nearby - I'm still on the lookout! it's the best! we have it weekly. we buy our quinoa by the pound along with several other items at our local Fairway. Monday D was cooking quinoa for dinner. we do this all the time with not problem, but this time the grain was not cooking and was still hard. so he decided to cook it a little longer. a little longer ended up being close to 40 minutes and it had still not softened. so he finally decides to taste it and figure out what was wrong with it. they were sesame seeds. Oh we love quinoa - we eat it every other week if not every week for dinners or lunches...I also eat it for breakfast every morning with a little PB, flax, coconut oil, cinnamon, raisins, and a little bit of pure maple syrup - it's delicious!!! It's really wonderful as it's a complete protein source and you can buy it organic in bulk. It's actually not a grain though, as it's a relative of chard and spinach. I've been using this yummy quinoa recipe. i just started making it, and i love it! it tastes like peas and is great instead of rice in a pilaf! My husband and I cook with quinoa a lot. One of or favorite recipes is this one: http://www.fatfreevegan.com/appetizers/black-b.shtml . Black Quinoa dip...great with homemade tortilla chips and a hit at parties. We never have bothered with the chives and it's still tasty! yes! you must try a breakfast version: cook it in rice milk, add a couple squirts of honey and top it with fresh berries and bananas...delicious! Yum! We love the recipe on the back of the Trader Joe's quinoa box (or here http://www.traderjoesfan.com/Trader_Joes/Recipes/Gourmet/Garlic_Chicken_Stir-Fry_with_Quinoa,_Peppers_and_Basil/details/), along with another one called Aztec salad from a friend. i love it! 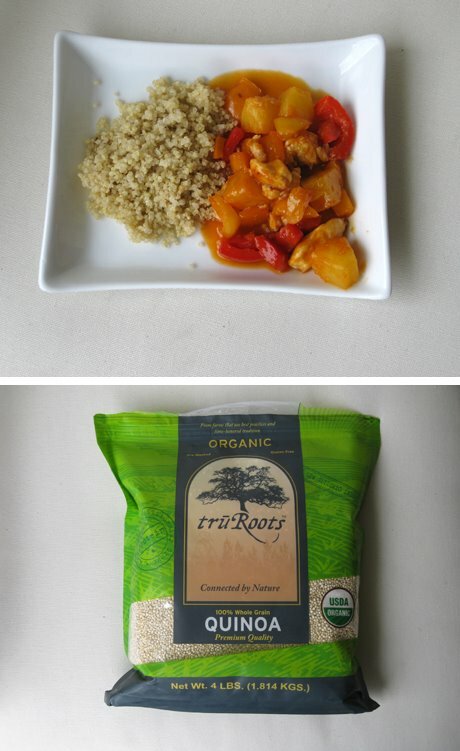 usually make a tofu stir fry with it, use it essentially as a substitute for the rice. yum yum yum. It's so good for you. But you need to add something to it or cook with chicken or veggie stock. add tomatoes and basil and it's delish! I know I'm a little late getting to this one, but Quinoa is wonderful! I tried a quinoa enchilada recipe a few weeks ago and it was so good, even my meat-loving father thought it was great. I usually cook it like Oatmeal and then toss in nuts and agave nectar. I like it for a not too sweet breakfast. I must admit, I like it even better with tomatoes, sauteed mushrooms, avocado, red onion and cilantro!